I'm on a roll this week! Last night I made a few more pieces for my shop. 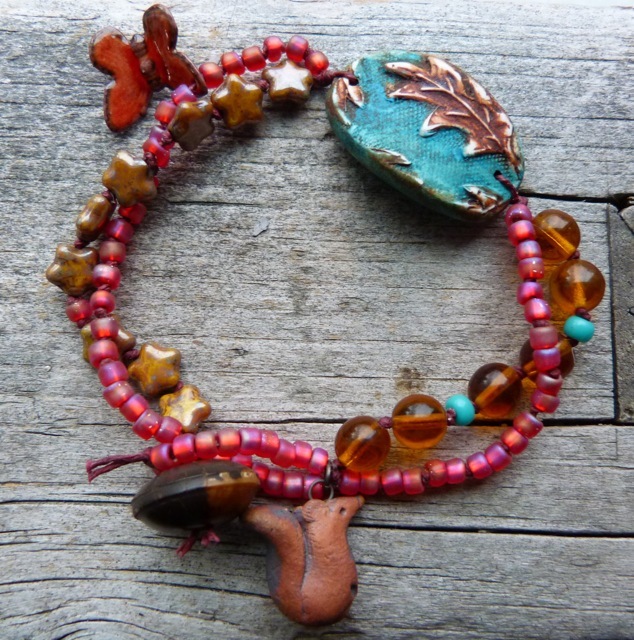 This first bracelet is a Summery take on the oak leaf focal from Humblebeads. I knotted glass beads on waxed linen cording, added a fun orange enameled butterfly from Gardanne Beads, and a Squirrel charm from Kylie Parry and finished it off with a vintage button. Oak Tree Oasis! Here is another take on a necklace design that was featured in Creative Jewelry magazine. 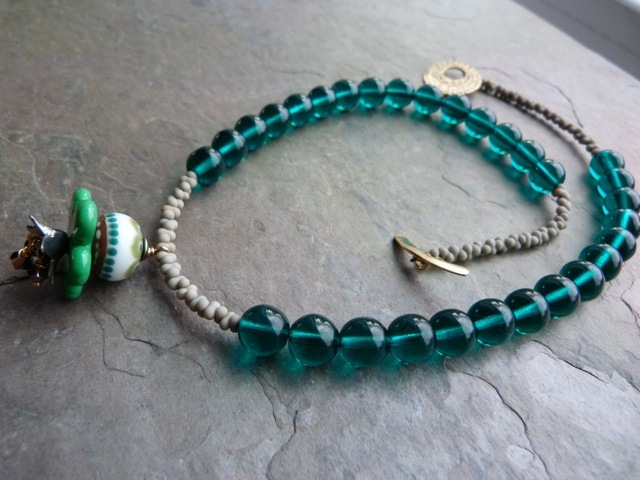 Deep teal glass rounds, and matte gray farfalle beads make up the necklace. I wire wrapped a lampwork glass focal (Loupiac), lampwork flower (Gardanne beads) and Pewter bead cap (Green Girl Studios) with some dangling swarovski crystals as the pendant. Finished it off with a bronze toggle from Saki Silver. And finally the Pod! I have had this pod for a while, from Round Rabbit Extra. I wire wrapped it with brass wire, and dangled some brass chain and attached several of Anne's enameled butterflies! As if they are hatching right from this organic pod. Instead of making an elaborate necklace for this focal, I simply used some brown Fairy silk ribbon for an extra airy and fantasy feel. These will be available in my jewelry shop momentarily. Love the colors in the first necklace - the shades of blues and cool grey is beautiful, and love the focal lampwork - so pretty! 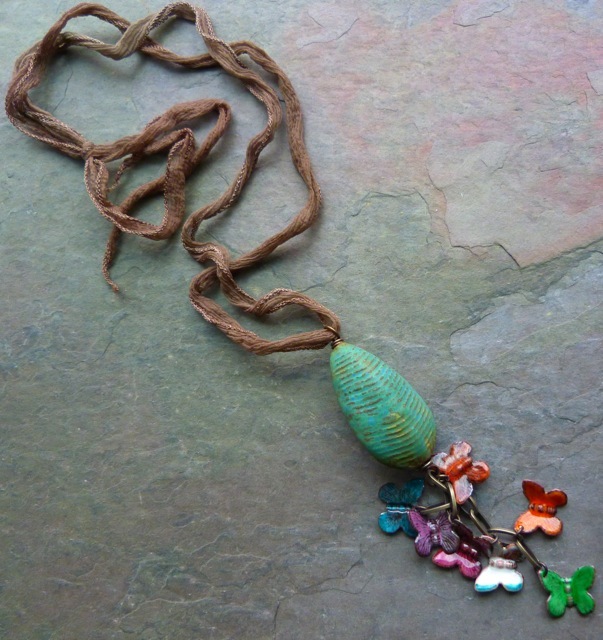 LOVE the butterfly pod necklace - I notice it sold right away. No surprise! I'm in LOVE with the pink bracelet! I'm surprised and amazed by the color combination - and the fact that it completely works! Beautiful pieces, I just love how you use colour. Very nice designs. I love the pod necklace and your use of colors is always so perfect!! Love to visit your blog, Lorelei. It's like taking a class in jewelry design, especially your asymmetrical work. Always interesting and inspiring for someone who is just beginning to venture into this territory. Thanks so much. You had me at "color"! I love all the fun colors! !